Pollok made it a hat-trick of draws in the League on Saturday, coming away from double winners Glenafton Athletic’s Loch Park with a share of the points after a 1-1 draw. 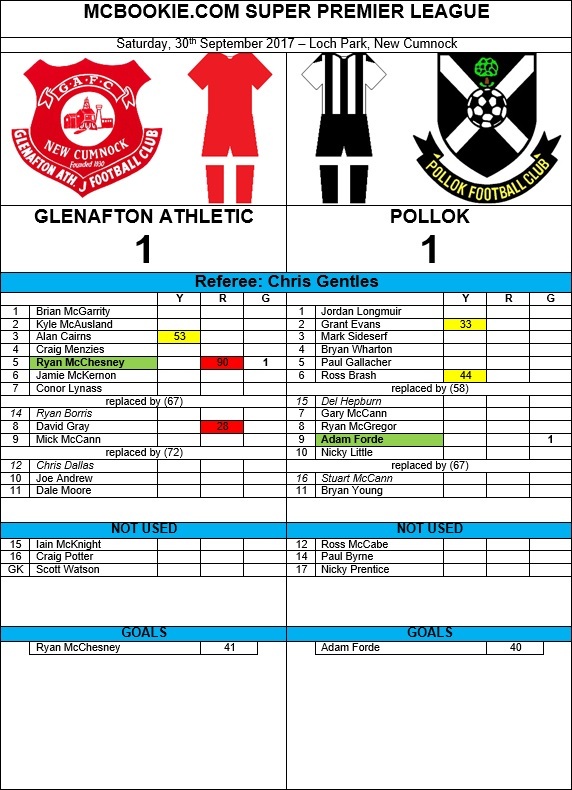 ‘Afton were reduced to ten men in the 28th minute when David Gray’s challenge on Ross Brash was deemed worthy of a straight red card by arbiter Chris Gentles. The visitors took a 40th minute lead when Mark Sideserf’s Garryowen caused confusion in the home rearguard. Ryan McGregor managed to free the ball from the ensuing melee into the path of Adam Forde who tapped into the empty net. Parity was restored by the homesters a minute later, Pollok custodian Jordan Longmuir’s weak punch falling to the feet of Ryan McChesney who gratefully accepted. Glenafton’s best chance after the interval came from Jamie McKernon’s flag kick which Longmuir did well to paw away from underneath his crossbar. Longmuir’s opposite number, Brian McGarrity, pulled off the save of the match to keep the scores level, springing across to deny Forde’s acrobatic scissor kick, before Del Hepburn placed a shot off the upright. McGarrity was fortunate moments later when he was beaten in an aerial duel by Stuart McCann, Gentles ruling the ‘Lok substitute’s challenge unfair as the ball nestled in the net. The final action came in the last minute of regulation time, Hepburn’s run towards the box was unceremoniously halted by McChesney, the Glenafton goalscorer joining team-mate Gray in the early bath. That’s it – all over. Another draw for the Lok. 90 mins: Glens go down to 9 men as their goalscorer is sent off. 72 mins: Stuart McCann replaces Nicky Little. 60 mins: Del Hepburn is brought off the bench to replace Ross Brash. 41 mins: GOAL!! The lead doesn’t last long as Glens get back on level terms. 40 mins: GOAL!! Lok take the lead through Adam Forde, his fifth goal for the club in his 11th appearance. 29 mins: RED CARD! Glenafton are down to 10 men. In charge today is Glasgow association referee Chris Gentles (Cat 2D). He was in charge of last week’s Scottish Cup tie between Lothian Thistle Hutchison Vale and Inverurie Loco Works. The only West SUper match he has done so far this season was Kilwinning’s clash with Clydebank in August.